In early December of 2000, Colin spotted this 1968 23' South Coast Alberg sloop, Linnet's Wings, for sale in the Great Bay Marine yard. Here was my "dream" sitting right there! Excellent! And then, since I was to begin a new job as a Senior Software Engineer at Equant Application Services in Burlington, MA starting 01/02/01, I got the "ok" Christmas Day to get her! This is a perfect boat for me. I needed to trade up from my open 18' O'Day daysailor that I had bought in the mid '80's. Poking around in the bay with the O'Day was fun, but you can't take a daysailor out too far as the waves could easily swamp her. She also handled poorly in really tough blows becomming overpowered. And without a place to get in out of the weather or have some sort of head facility really limited how far you could go and how long you could be out. I had been "dreaming" about a larger boat for some time, but never really felt the timing was right. The O'Day was perfect for what I originally wanted: a boat with no maintenance that I didn't have to worry about getting tough with. 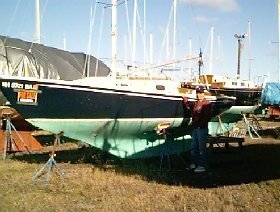 I don't "do" boat maintenance, and so if I was going to trade up it had to be to another old, tired boat that I would not have to worry about. The Seacoast of New Hampshire is only 18 miles long, but contains the Piscataqua River and Great Bay. It is an area rich in history. I live up river in the area enclosed by the green square at the Northern fork of the river. Bearing to the left under the General Sullivan Bridge takes you out to Great Bay, while bearing to the right leads you up a beautiful journey to downtown Dover, NH. As you can see from the map, it would be quite a haul from my house over to Great Bay- even with a small engine. But now, with Linnet's Wings it becomes far more reachable. And the weather can change very quickly in that area. I have been out in the Adams Point area- which is the narrow slot just as you go from Little Bay into Great Bay- when the wind has suddenly increased and kicked up 3' confused chop. Not a place for a small open boat! Great Bay itself is a huge tidal basin. Though the center is quite deep, you have to mind your charts as it is deceptively shallow even far off the shore. One time Pat and I were out in an old 22' HighLiner we owned just West of Adams Point in the bay itself. We were having a grand time sipping Champaign and swimming in the warm water when I felt a thud against the hull. I figured a floating log had hit us, but when I looked over the side I was shocked to see that the tide was running out so fast that we were about to be grounded in the mud! While I yanked up the anchor and got the motor ready to start, Pat was busy shoving us toward deeper water with one of our 12' oars. Good thing, too because just a few more minutes and we would have been spending the next several hours enjoying the Great Bay mud flats! That's how fast the water comes out of Great Bay! I live on Cote Drive in Dover, NH which is up the Piscataqua River about 10 miles from Portsmouth, NH. As you can see from the map, the area is great for a daysailor. But with the open ocean just a few miles away, the lure of the sea breezes is just too much for a poor boy to ignore! The Alberg has a 6hp Evinrude motor and so the trip from the Pomeroy Cove area by Cote Drive to just outside of the Portsmouth Harbor bouy 2KR is about an hour- as long as the tide isn't running against you. Coming down the Piscataqua from Dover, you also have to wait for the Memorial Bridge in Portsmouth to go up. The Route 95 Interstate high level bridge and the "Middle Bridge" (the Sarah Longfellow Bridge) of the Route 1 By-Pass have high enough spans that the Alberg's 28' mast can pass under with little problem. But you have to wait for the Route 1 Memorial Bridge. And with the current so tough there, it is a real challenge. 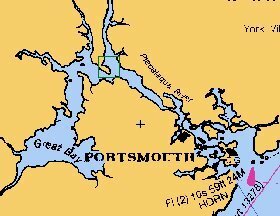 On the map, 2KR is just about where the larger of the 2 islands laying just outside of the Portsmouth harbor entrance. It is a major navigational point in the area, and references are constantly made to it. The famous Isles of Sholes lies only 7 or so miles off shore from 2KR. Gosport Harbor is a veritable Mecca of sail and power craft on most summer weekends, and is a great place to "duck in" if the weather turns on you- which it easily can out here on the East Coast! 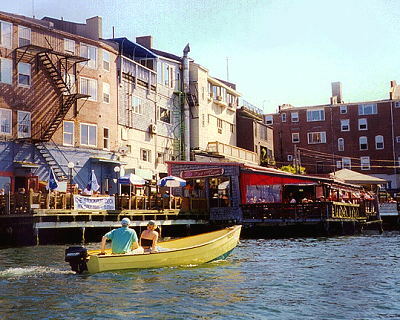 Boaters pull alongside the waterfront decks on Bow and Ceres street in Portsmouth.
" The name Linnett's Wings came from a poem by Willam Butler Yeats, "The Lake Isle of Innisfree". A Linnett is a Eurpoean bird (Irish), part of the finch family... The poem refers to Yeat's desire to return to a quieter and more peaceful self and place in life: "I will arise and go now, and go to Innisfree, ...And evening full of the linnett's wings." The linnett's wings referred to in the poem were to me a proper metaphor for sails...the places the wings or sails would take you were always better than where you were. " No ship can be without it's "ship's log"- the chronicle of where the boat has gone and what experiences were had. To that purpose, I will try to keep up with posting all of Linnet's Wings log entries to this site. And contrary to a standard log's entries of only positional and weather information, I feel a log should be more of an expression of all the boat is and how the people who sail her interact with her. A log is the story of the boat, and I hope to be able to provide an enjoyable tale of my experiences with Linnet's Wings through the years. And not so much for anyone other than just myself. As I grow older I realize that I don't have 20 years of endless time to just sail. A day will be reached where I have to finally slow down and grow up and I want to have these memories perserved to read over the warm glow of a winter's fire. Well, we'll just have to see how it goes. In fact, I plan to chronicle all activity surrounding Linnet's Wings, not just the times when I am actually sailing her. There is so much more to a boat's story than just when she's under sail. 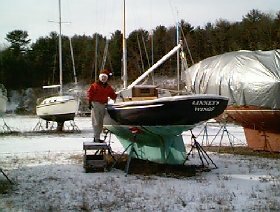 A boat sails even when up on jack-stands for the winter; there are stories to tell even in the dead of winter with snow piled around the mast base. In fact, the boat's soul merges with the Captain's and the two become one entity striving to fulfill each other's destiny through all of life rather than just those fleeting times when the wind fills the sails and spray flies over the bow into the Captain's smiling face. The wind is always blowing somewhere and the Captain should always be smiling and so the story never ends! Life is good. 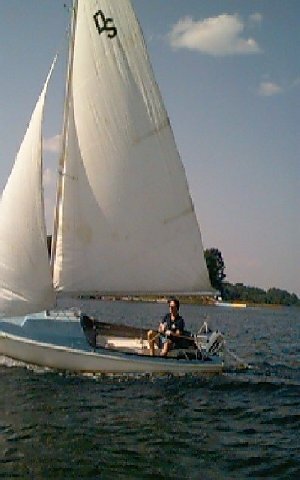 Unfortunately, a divorce has sent me off the water to a condo, and time, money, and an arthritic hip will not allow me any sailing time for the foreseeable future. So I have sadly come to the point where I must part with Linnet's Wings. Today, 08/03/04, Arden and Keith from Long Island drove up to look Linnet's Wings over. They must have fallen in love with her immediately as the deal was shaken over and sealed with little fanfare. It will be sad to let her go, but it is probably sadder for me to see her just sitting in her jack stands in the Great Bay Marine storage yard.